Human Capital Priorities Stream of Ontario province announced 185 invitations in a draw conducted Novr 26- the popular Express Entry-associated stream’s initial requests since Aug 9. The Human Capital Priorities Stream enables the O.I.N.P to search the federal Express Entry candidates pool who satisfy its federal and provincial criteria and invite those chosen to appeal for a provincial nomination for Canada PR. 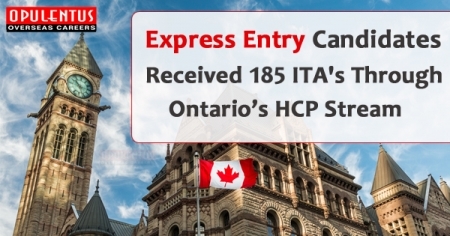 Express Entry applicants who appeal for and obtain a provincial nomination from the Ontario province get a further 600 points toward their CRS score, which leads them to the beginning of the line for an ITA for Canada PR. Express Entry applicants chosen in the Nov 26 draw had scores of CRS ranging from 350 to 448 and a job offer in the province of Ontario, which is not needed to be qualified for the Stream of Human Capital Priorities. Those chosen presented their profile in the system of Express Entry within Jan 1, 2018, and Nov 22, 2018. In the month of Sep, the O.I.N.P declared that it was substituting the demand that Express Entry applicants have a CRS score of minimum 400 to qualified for the Stream of Human Capital Priorities. Moving ahead, the O.I.N.P said the program’s director would determine the minimum score in accordance with the needs of the province. The O.I.N.P has now announced focused invitations in each of its last 04 draws by the Stream of Human Capital Priorities. A couple of these draws observed the least CRS score fall to 351, while the last 02 targeted job offer draws observed the least score fall to 350.